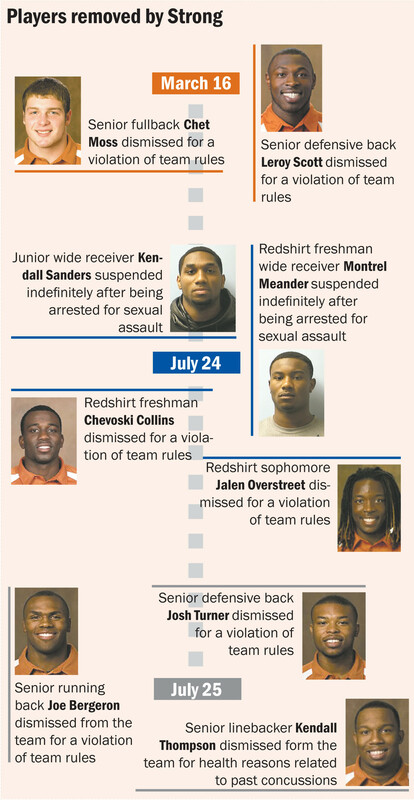 The Longhorns’ loss of seven players, a few of whom were expected to have important roles in 2014, over a 48-hour span last week poses an obvious question for Texas football fans: How will Charlie Strong and his staff fill the void left by the dismissed athletes? While none of these dismissals have been officially confirmed by the program, it appears an announcement is merely a formality. OrangeBloods has reported that the dismissed Texas players will all get a chance to meet with Strong on Monday, where the dismissals are expected to become official. Kendall Sanders and Josh Turner were both expected to start for Texas, Joe Bergeron was likely to continue to play an important role in the Longhorn backfield, and Jalen Overstreet, Chevoski Collins and Montrel Meander were each poised to add necessary depth at their respective positions. The Longhorns also lost senior linebacker Kendall Thompson, who is leaving for medical reasons. In addition to those who have already been given the boot, ESPN’s Max Olson has reported that as many as five more players may soon be facing dismissals for violating team rules. But even without additional departures, Texas is already looking thin at some key positions. Turner was likely slated to be one of the starting safeties for the Longhorns while Collins was set to be his backup, but with both off the team, Texas will likely start sophomore Adrian Colbert at one of the safety spots. True freshmen such as Edwin Freeman or John Bonney will likely get a chance to play significantly from day one. The loss of Bergeron and Overstreet will cripple Texas’ depth at running back, especially if junior Johnathan Gray or senior Malcolm Brown get injured, as they have in the past. Other than that, Texas only has true freshmen Donald Catalon and D’Onta Foreman at the position, though Foreman has yet to officially qualify. At receiver, Texas returns its top two options in senior Jaxon Shipley and junior Marcus Johnson, but the loss of Sanders means one of the younger players will have to step up to the position, though Texas has plenty of potential options from the 2013 or 2014 recruiting classes. Finally, the loss of Thompson means some loss of depth at linebacker but isn’t particularly devastating for the program. Texas returns crucial starters in senior Jordan Hicks and Steve Edmonds, whose health will determine the vitality of the position. Obviously, the final depth chart will depend on who is left on the team at the start of the season, but it is clear that Strong isn’t messing around with the rules. Right now, none of Texas’ losses are particularly brutal, but if they lose more players, especially potential starters, 2014 may be filled with a lot more downs than ups. Malcolm Brown, Joe Bergeron and the offensive line are going to have to shoulder the load Thanksgiving night. A dose of freshman backup quarterback Tyrone Swoopes could also help give the Longhorns an advantage. A few series from him early in the game to get a solid zone-read attack set up could be a weapon the Texas Tech defense has no answer for, similar to the way Kansas State deployed Daniel Sams and John Hubert against the Red Raiders en route to an emphatic 49-26 victory. If the Longhorns can get creative in setting up their rushing attack and get Brown and Bergeron up and running, they should be able to extend their current winning streak over the Red Raiders to five games. Texas loses if... the defense doesn’t tackle well. Kliff Kingsbury’s offense is explosive, ranking No. 13 in the country in total offense while averaging 37.5 points per game. They are capable of beating you over the top with their athletes, such as tight end Jace Amaro and wide receiver Eric Ward, but they will also lull a defense to sleep, dinking and dunking their way down the field. The Longhorns defense cannot let a seven-yard completion turn into a 60-yard completion if they want Thursday night to go according to plan. With the current situation on the offensive side of the ball, the Longhorns will have to win a grind-it-out type football game, not engage in a high-flying shootout. Texas loses if they can’t generate a pass rush and don’t tackle soundly on defense, which would represent the fourth straight loss the Longhorns have had on senior night. Like Joe Bergeron last season, Malcolm Brown has been the thunder to Johnathan Gray’s lightning. But with Gray sidelined for the rest of the year with a ruptured Achilles tendon, Brown and Bergeron are the top two Texas tailbacks. And, as nature tells us, there is no thunder without lightning. Texas’ offense is at its best when it has a reliable running game to set up its passing attack. Run the ball, run it some more and then take a shot downfield. Without Gray, it becomes much more difficult to execute that gameplan effectively. Brown had become the Longhorns’ short-yardage running back this year, a role that Bergeron thrived in last season when he ran for 15 touchdowns. Case McCoy has passed for eight touchdowns this year, averaging 35 yards on those scoring strikes. Three of them came last weekend against West Virginia, including a 49-yard bomb down the sideline to Mike Davis. The Mountaineers led by 10 points before that third-quarter touchdown, their biggest lead of the game. But Texas erased that deficit and went on to pick up its first overtime win in program history. McCoy was praised for his three touchdowns, tying a career high, but that’s not possible without the threat of a dynamic running game causing West Virginia to stack the box, allowing McCoy taking well-timed and well-thrown shots downfield. Is that threat still there without Gray? Yes, but not nearly as much. Gray is the one that could bounce it outside with Brown and Bergeron getting yards between the tackles.McCoy has an unquantifiable moxie that makes it easy for his teammates to rally around him and gives him the ability to come through when it matters most. But he needs a great supporting cast to be productive – a brick wall for an offensive line, a dynamic group of tailbacks and a stingy defense. Losing Chris Whaley for the rest of the season deals a big blow to that defense. But the rest of the defensive linemen’s performance doesn’t depend on Whaley like the rest of the running backs’ performance depended on Gray. Jackson Jeffcoat and Cedric Reed will still be the best 1-2 pass rush punch in the Big 12, possibly the country. Desmond Jackson, who notched two sacks and a key forced fumble after replacing Whaley last weekend, should have no problem taking over for the converted running back, especially since he made 11 starts last year. Whaley’s absence also doesn’t shift as much as responsibility as Gray’s absence does. Now, more of the offensive onus falls on McCoy, which is not necessarily a good thing. Going into halftime against West Virginia, McCoy had one touchdown pass and five interceptions over the last 11 quarters. That’s someone you want to set the offense up for, not someone you want actually setting up the offense. And it’s a lot harder to do that with Gray walking around with crutches and a boot. The Longhorns‘ overtime win against West Virginia on Saturday extended their win streak to six games and allowed them to rejoin Baylor atop the Big 12 standings. The night remained far from perfect for Texas, as the Longhorns suffered a pair of critical losses in the victory. Senior defensive tackle Chris Whaley (knee) and sophomore running back Johnathan Gray (Achilles) each sustained injuries requiring surgery in the game, ending both of their seasons. Gray enjoyed a breakout season through his first nine contests, leading the team with a career-high 780 rushing yards on 159 carries while scoring four touchdowns. Despite this prolific start to the season, Gray believes junior running backs Malcolm Brown and Joe Bergeron are capable of filling his void. Brown is expected to receive the majority of Gray’s carries after compiling 379 rushing yards and seven touchdowns in his past four games. Bergeron also figures to see a considerable spike in touches as the new backup running back, especially after receiving just 16 rushing attempts in the past six games. Texas also faces the tall task of replacing Whaley, who accumulated 25 tackles, two sacks and five tackles for a loss in nine starts this season. Whaley also scored a pair of defensive touchdowns, one on an interception return against Oklahoma and the other on a fumble return against Kansas. Junior defensive tackle Desmond Jackson turned in an impressive performance Saturday after Whaley went down, racking up eight tackles and two sacks in the victory. He is slated to be the starter this week in Whaley’s absence, with freshman Hassan Ridgeway stepping in as the backup. While the injuries to both Gray and Whaley are substantial, Texas is no stranger to losing key players on both sides of the ball. The Longhorns lost junior linebacker Jordan Hicks to an Achilles injury after the fourth game of the season, while junior quarterback David Ash played in just one of Texas’ last seven games after suffering a concussion on Sept. 7 against BYU. Because of this, head coach Mack Brown believes the Longhorns possess the ability to weather the injuries to Gray and Whaley as they have in the past. The Longhorns remain confident in their ability to carry on without Gray and Whaley, and they expect their depth to allow them to combat this new list of critical injuries. One year ago, junior running back Joe Bergeron was considered one of Texas’ main offensive forces. Today, it’s rare to hear his name at all. Although he was hyped up as being one of three strong running backs entering the year, Bergeron has yet to make his mark on this season. But the back is handling this newfound situation in the best way he can. At this point in the season last year, Bergeron had 104 carries and 16 touchdowns. This year he has been given the ball only 31 times, tallying just two scores in eight games this season. There have been many reasons for Bergeron’s diminished playing time, the biggest of which is the rise of running backs junior Malcolm Brown and sophomore Johnathan Gray. Brown and Gray have stepped into the role Bergeron was hoping for this season, recording 779 and 503 all-purpose yards respectively. The two have combined for 12 Texas touchdowns. One of Bergeron’s most impressive features was his ability to pound the ball into the end zone in goal-line situations. But Brown has taken over the primary role Bergeron used to have. Another problem for Bergeron is the fact that he has fumbled in many prominent situations. Against Iowa State, the junior fumbled in Longhorn territory, which led to a Cyclone score. Nevertheless, Bergeron hasn’t let this reduced play turn negative. He has become a force on special teams, showing up on kickoff coverage, kickoff returns and even on the punt team. Johnathan Gray entered his freshman season at Texas last year with enormous expectations. Every major recruiting service dubbed him as the nation’s top running back in the 2012 recruiting class – and with good reason. Gray enjoyed a historically productive high school career at Aledo, where he scored a national-record 205 career touchdowns. Additionally, Gray stands second in high school football history with 1,232 points scored, and he finished his career ranked third all-time with 10,908 rushing yards. He won three consecutive Texas 4A state titles, running for 323 yards and a jaw dropping eight touchdowns in his first state championship game as a sophomore in 2010. While it is unrealistic to expect Gray to replicate these extraordinary statistics at the college level, head coach Mack Brown believes the versatile sophomore running back is already one of the Longhorns’ most important players. Gray emerged as Texas’ top running back by the end of his freshman season. Despite beginning the year buried behind Malcolm Brown and Joe Bergeron on the depth chart, Gray finished the 2012 season with a team-leading 701 rushing yards on 149 carries while scoring three touchdowns. Brown named Gray the Longhorns’ starter at tailback to begin the 2013 campaign. Even though he still shares backfield duties with Brown and Bergeron, Gray is elated that his hard work in the offseason coupled with his production last year allowed him to earn the opportunity to be the starter. Gray continues to be effective in 2013, as he leads the Longhorns with 209 rushing yards while averaging 5.5 yards per carry and scoring a touchdown. Co-offensive coordinator Major Applewhite believes Gray possesses a greater understanding of the playbook this season, and he notices the sophomore improving every time he touches the ball. Despite his success, Gray realizes that the Longhorns’ offense is at the best when Brown and Bergeron are also producing from the backfield. The sophomore said that each occupies a distinct role in Applewhite’s scheme, and it is up to the stable of running backs to continue improving. Gray seized a leadership role in the Texas locker room at the start of the season. Senior left guard Trey Hopkins said Gray is one of the more vocal players on the Texas offense, and he believes that the Longhorns’ players maintain great respect for the running back despite his sophomore status. The Longhorns figure to depend heavily on Gray on the field as well for the remainder of the season. While Gray realizes that his high school accomplishments are in the past, a breakout season from the standout sophomore running back would be his first step towards living up to the hype. Texas’ backfield is made up of thunder (Joe Bergeron). lighting (Jonathan Gray) and Malcolm Brown, well, he’d be the tornado. Deadly when in form, but when hampered by a minor elemental change, tends to fall apart. For Brown, that’s not wind speed or temperature, it’s almost a literal Achilles heel: a body prone to injuries. Expect that to change in 2013. Brown is primed for a breakout season and will finally shed the injury label that’s nagged him throughout his time at Texas. At that point, Brown appeared as a force. His fellow freshman back Joe Bergeron was a mere afterthought. Brown was destined to be the next Longhorn in line for a legacy that includes Earl Campbell, Ricky Williams and Cedric Benson. Then the injuries started to creep in. A turf toe issue kept Brown out of the next two contests and hampered him the remainder of the season. Before the foot issue, Brown was on pace to break the Longhorns freshman rushing record. After it, he averaged just 2.6 yards per carry. Brown’s tale spun similar in 2012. Actually, the start of his season was odd. He rushed for 105 yards in Texas’ first game, then received only two carries in the next contest, before rushing for a team-best 128 yards against Ole Miss. But his injury history caught up to him once again, and he missed the Longhorns’ next five games with a sprained ankle. At that point, freshman Johnathan Gray gained favor in the Texas backfield, and when Brown returned, the carries weren’t there. Now, Brown enters 2013 as the forgotten man. Gray, a five-star recruit and high-school record-breaker himself, is the lead back on the depth chart, and head coach Mack Brown raves about his toughness. Gray will have a successful season. He’s publicly stated his goal is to gain 1,500 yards, and will require a large bulk of the carries. However, Brown is healthy and poised for a 1,000-yard season himself. The 6-foot, 220-pound junior back spent the offseason working through targeted muscle strengthening drills, everything from stretches to even a little yoga, which he describes as his least favorite exercise, by far. Fact is, he’s feeling healthy and if Brown stays that way, he’ll be effective. The Longhorns new up-tempo offense will create an additional 12-15 snaps a game, meaning each back will get numerous chances to shine. Texas’ top trio of backs will have a set rotation, and will each see the field with consistency. Bothersome feet held Brown back his first two seasons, but expect the same limbs to carry him to greatness this go-around. After all, without their feet, how can anyone expect to move forward? (876) Texas running back Joe Bergeron scores a touchdown in the second half. Though most of the hype surrounding the Longhorns’ offense is focused on junior quarterback David Ash, the most promising aspect of the 2013 team is likely to be its trifecta of running backs. Juniors Malcolm Brown and Joe Bergeron and sophomore Johnathan Gray come together to create a stable team of running backs poised to propel Texas’ offense. Head coach Mack Brown emphasized the importance of a prominent running game and said he plans to employ a consistent and effective backfield each week to remain balanced offensively. Gray earned the starting nod for the season opener against New Mexico State. The sophomore running back led the team with 701 rushing yards on 149 carries as a freshman in 2012. He is the most explosive member of the Texas backfield and boasts an elusiveness and an ability to find holes in the opponent’s defense. Bergeron, a 6-foot-1-inch, 230-pound bruiser, expects to receive the majority of the Longhorns’ goal-line snaps. The junior led Texas with 16 touchdowns last season, and has scored 21 times on the ground in his career. The player with the most to prove and gain is Brown. The junior running back missed nine games because of injury in his first two seasons, including six games in 2012, which limited him to just 324 rushing yards on 61 carries and four touchdowns. Now, Brown hopes to remain healthy by taking steps to change his eating habits and to do more focused muscle training. Despite Brown’s brush with injuries, co-offensive coordinator Major Applewhite is impressed by his focus and devotion to return to the field. Brown is eager to get back in the lineup on Saturday. He believes in the potential of the Longhorn rushing unit and feels there will be enough carries to go around.